Bones of spectacular new species of fossil vertebrates, or unusually complete specimens, may be prepared for display. The bones are strung together on metal frameworks or, more frequently, casts are mounted with internal supports. 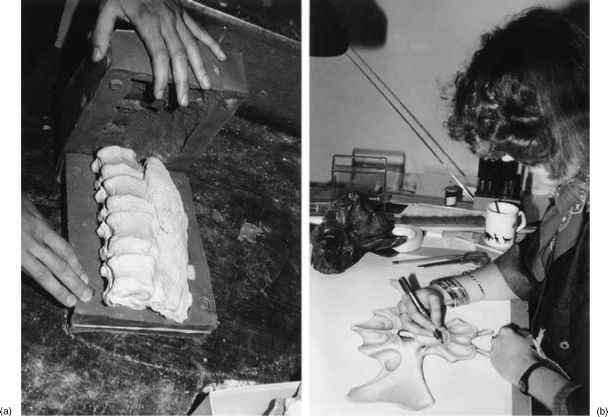 Casts are made in tough lightweight materials, such as fibreglass, from moulds of the original specimens (Figure 2.4(a)). Most fossil vertebrates, however, are never displayed, but are reserved solely for study. The specimens may be studied at once by scientists in the institution that did the collecting, or they may be preserved in the museum collections for later work. In any case, museums have a duty to conserve their specimens in perfect condition, and to maintain full documentation about their holdings. Palaeontologists find out about the location of specimens from published descriptions of fossils and from various paper and electronic information services. undamaged specimen, the palaeontologist may be able to test the fit of the bones directly. It is possible to slot together the bones of the skull like a three-dimensional jigsaw, and to test the stance of the limbs, to some extent, by fitting the bones together end to end. 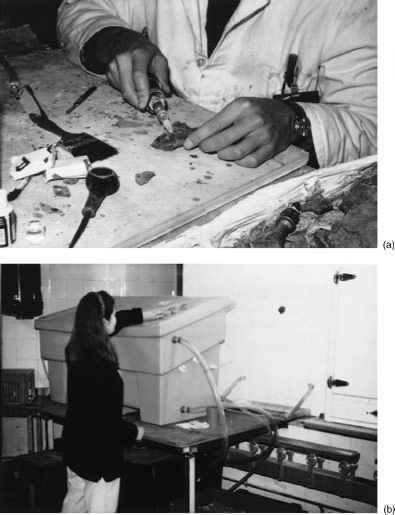 More normally, the palaeontologist must use information from several specimens in order to reconstruct the original appearance of an undamaged skeleton. In matching up bones, allowances must be made for different sized animals, and in difficult cases scale models may be made of missing bones. Extensive restoration is possible because ver tebrate skeletons are bilaterally symmetrical, and because many bones, such as vertebrae and ribs, occur in repeating or gradually changing series. Most fossil skeletons have been compressed or broken up, either before being buried (physical damage, scavenging), or after being buried (compression of the rocks, chemical effects). The palaeontologist must recognize this damage, and try to correct for it by restoring missing parts of bones and making careful measured drawings and models to remove the effects of distortion. Accurate reconstructions are the basis of further study in vertebrate palaeontology. The palaeontologist publishes a detailed description of all the bones that are available, and gives a reconstruction of part, or all, of the skeleton. Clearly, illustrations are important, and published descriptions are accompanied by drawings (Figure 2.4(b)) and photographs. These then form the basis for more artistic renditions of the animal in life, either as pen sketches (look at the examples by John Sibbick in this book), as colour paintings, as static and moving models, or as animations. The dinosaurs of Walking with Dinosaurs (see Box 2.1) looked so good because of the combined input of work by palaeontologists, artists, and animators. 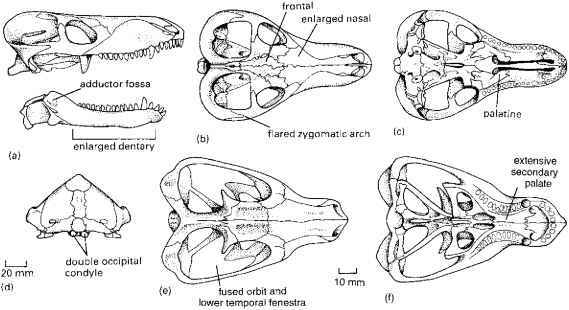 How to study fossil vertebrates?